I was born in Brooklyn, New York in the 60’s where I had a very nice, normal childhood in a modern orthodox Jewish family. My family included a brother and a sister, great parents, and a big extended family. When I was 18, my family re-located to Fifth Avenue in Manhattan, and I attended NYU. I played basketball with the Lady Violets, and studied journalism. After a brief foray to Italy, I ended up working for my father, who was a leader in the diamond industry. The plan was to work there for 6 weeks, while my sister was on maternity leave, but I ended up staying, and here I am 30 years later running William Goldberg with my family! It is an amazing business, and I have always been passionate about it. My father built a beautiful business where we sell things that “bring joy into people’s lives” as he said. I married and had two beautiful children, Isaac and Beatrice. After 10 years, my husband and I divorced. Throughout all his indiscretions in our marriage, I supported him fully, and did everything that a smart woman should not do. I once saw a book in the self-help section of Barnes and Noble titled -“Why smart women do stupid things”- that was me! But, I had Isaac and Bea, and so I could never regret being married to him. I ended up raising both my children as a single mom, making every decision on my own. Anyway, I had a wonderful family, and friends, and got through it. In May 2013. I finally got it right. I married Neil, an amazing man who came at just the right time. Without him I don’t know if I would have survived the next chapter. Neil got very close with Isaac and Bea and he really became a consistent and positive role model for both of them, particularly Isaac. When Eve Goldberg tragically lost her son Isaac to drug addiction in 2014, she almost immediately found herself looking for a tangible way to honor him. He had completed a treatment program and then lived in sober housing after that. He was living at home with his family, still struggling to find his footing with sobriety when he passed away. Determined to make meaning out of his life, Goldberg refused to believe that he died for no reason. Not long after observing a traditional Jewish shiva for a week, she was struck with an idea. What started as a basketball tournament on his birthday (Isaac was an avid player), is now the non-profit BIGVISION (the “IGV” is always bold in honor of her son’s initials, Isaac Goldberg Volkma), an organization dedicated to creating a solid, reliable, fun and—most importantly—drug-free community for young people in recovery in New York City. Goldberg’s vision and ability to bring it to life is why she’s our latest AfterParty Hero. Eve Goldberg was walking around Tribeca with her son, Isaac Goldberg Volkmar, a few years ago looking for a place to eat. That doesn’t sound like a challenge, except that Mr. Volkmar, who would be 26 years old now, had a history of substance abuse. 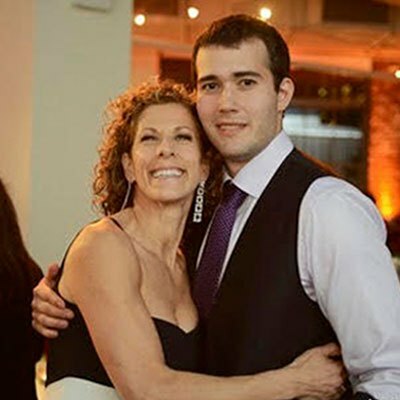 When Eve Goldberg’s son Isaac passed away a little over two years ago from an accidental overdose from opioids, she knew she wanted to do something meaningful and charitable in his memory. “My dream was to create a sober clubhouse, a community where young adults in recovery participate in fun activities,” she said. Her parents had a donor advised fund with Jewish Communal Fund for many years, so she turned to JCF to establish the Isaac Goldberg Volkmar Fund. Friends and family donated money to the fund in memory of Isaac. “It was fantastic,” she said of working with JCF. “It really helped me.” Her daughter, Beatrice, subsequently ran a half marathon when she was in school in Michigan, raising close to $20,000 for the cause. Last year, Goldberg founded BIGVISION, a 501(c)(3) charity based in Manhattan that serves as a community for young adults in recovery from addiction. Twice monthly sober events include small get-togethers featuring knitting, spinning, hikes and indoor rock climbing. These activities are especially important because many who suffer from addiction isolate themselves and don’t know how to enjoy themselves being sober, she said. Isaac was the kind of person who was always helping people, she said. He was kind and compassionate, good looking and tall and funny. “We’re continuing with his mission; he would have loved this,” she said. This past week would have been Isaac’s 26th birthday. Big Vision held a basketball event to mark the occasion since that was the sport he was most passionate about. The name of the charity – BIGVISION– was the brainchild of Rabbi Josh Kohl of NCSY. The “IGV,” which is written in bold typeface, represents Isaac’s initials. When Barry Jay gave up drinking and doing drugs, he needed something to transfer his addiction to that was healthy. When he took a desk job at a popular fitness studio in West Hollywood, California, he found his calling. “Fitness saved my life,” says Jay co-founder of Barry’s Bootcamp, a popular high-intensity workout with a huge celebrity following and 20-plus locations nationwide. Now, with 11 years sober and a revolutionary exercise program known as “The Best Workout in the World,” Jay is addicted to staying sober and helping others achieve sobriety. Barry’s Bootcamp is hosting a pro bono community class with BIGVISION from 5:30 to 7 p.m. at Barry’s Bootcamp Tribeca at 1 York St. in New York. Developed by Eve Goldberg who lost her son to an accidental drug overdose, BIGVISION is an organization that provides a sober environment for young adults in recovery from drug abuse to connect and have fun. Jay will lead a 60-minute workout (the signature Barry’s Bootcamp workout regimen combines equal length intervals of cardio on the treadmill and floor work, such as weight training and resistance exercises) and hold a Q-and-A about his life and the obstacles he faced during his personal recovery from drug abuse. The class is exclusively for the members of BIGVISION to help them find activities that can assist in their recovery, so we sat down with Jay for a preview. Renew: What does your road to recovery look like? Barry Jay: I got sober—for the first time—in 1988. I did it on my own. No program. I was in West Hollywood, so I joined a gym. I was very serious about working out. I was getting a lot of nice compliments (vanity further fueled my love for fitness). But I wasn’t in a program for recovery. I never wanted to go back to 1983 to 1988—when I was on every drug under the sun, many times at the same time—but I saw all of my friends enjoy a glass of wine after a hard day. Wine wasn’t my preference, but pot I loved. Instead of a glass of wine after a long week, I thought I could have a few puffs of a joint. I had myself believing that to could be the truth. I didn’t think I was lying to myself. But I'm an addict. I didn’t know that at the time. I thought I was just in my 20s. I didn’t connect that I was powerless. But that weekend pot smoker became a daily pot smoker right away. But I was still teaching 40 workout classes a week at Barry’s Bootcamp. I was showing up early, and I was staying late. Then what happened was I met a guy. (It’s always a guy.) He wanted to go dancing, and I hate dancing. He said, “Have you ever tried ecstasy?” I said no, which was a miracle. (Only later on did I remember that I had tried it once.) “Oh, well, that’s why you don’t like dancing,” he said. So I tried it. I still hated dancing, but I loved the ecstasy. When you’re out at a gay club dancing, there are a lot of people falling out on the drugs and having a bad reaction. People started calling me Florence Nightingale because I wanted to go outside and see who needed help. I would talk to the people and bring them water. But I was on the verge of dying. On Nov. 6, 2004, I reached my own personal, spiritual bottom. I felt hopeless. I went to Disneyland because I was poor, but I had a season pass. I was there alone. It was awful. It was the most miserable place on earth. It wasn't working. I’ll never forget that day. One of my friends from boot camp brought me to a meeting the next day. I’ll always remember he said, “Sobriety doesn’t mean your life is always going to be good. It means good or bad, you’re always going to be present.” I couldn’t remember being present in my adult life. It seemed like it was time. I had no other options. The first ray of hope, the first good laugh I had, was my first meeting Nov. 7, 2004. Renew: How is exercise and Barry’s Bootcamp a part of your recovery? Exercise is not the key to staying sober. But it’s a gift of being sober. Exercise is part of recovery. We’re not just recovering from alcohol and drugs. We’re recovering from the damage the drugs did to our bodies and minds. Feeling good about working out is a great tool for positivity. It helps us mentally. It helps us with stress. There are a lot of emotions that run crazy in the first year of recovery. We can’t afford resentment and anger. When you get to class and you get through it, you feel like a million bucks after. For the best recovery, to enjoy recovery, I don’t want to be sober and out of shape and smoking. I want to be sober and healthy, sober and caring for myself. Renew: What is going to be your message during the BIGVISION class? Barry Jay: Addiction is such an isolating disease. To feel comfortable in your own skin, to be out in public when everyone is drinking and making it look fun, and you’re like, “How am I going to relax?” We have to have places where we can go and enjoy life sober. You can come to class, you can feel great and you can do it with friends. This is one thing you can do transitioning back to life. Don’t go home and do jigsaw puzzles. It doesn’t work. It’s not a way of life. You can’t binge watch TV for the rest of your life. You’ll be bored. BIGVISION bridges an important gap. I am grateful for a place like BIGVISION that makes it their mission to show you how to go back to life and enjoy it sober. Max Hirsh is my special guest. Max is the out reach coordinator for a very important organization called Big Vision. They provide wonderful activities in a sober environment for young adults recovering from drug and alcohol abuse. Two years ago today, Issac Volkmar, a University of Rhode Island student, lost his battle to drug addiction. It was a disease he shied away from discussing due to the stigma surrounding it. "Honestly, one of the hardest things for Isaac was to talk about it and admit that he was an addict... to admit that he had what some call, 'substance abuse disorder.' Some people don't like the word 'addict.' Whatever it was, Isaac didn't like to tell people. He was ashamed of it," says his mother, Eve Goldberg. However, Eve, is not ashamed to bring light to this dark subject, and is spreading the word through a special initiative. She and her daughter throw pies in each others faces as part of the "Wipe the Face of Addiction" campaign, started by the Stacie Mathewson Foundation. The goal is to erase the stigma associated with substance use disorders. Eve knows first hand that addiction can affect anyone. "High school was the beginning of his down fall. He was a great basketball player, he was on the team, he was captain of the team, he wanted to play division three ball. Once he started getting into this habitual pattern of drinking and smoking pot, he wasn't the same anymore," she says. Friends of Isaac's are also taking the challenge in his memory. Pat Brown met Isaac at URI and said he never knew the daily struggles Isaac faced until it was too late. "I think we all have a friend or a family member that has either died or has had some serious problems with addiction, either drugs or alcohol. I think it is a great way to maybe trigger that thought in someone's mind, like, 'maybe I should say something to my friend who is having that problem,'" Brown says. Since Isaac's passing, Eve has started a non-profit in honor of him, helping other struggling teens and adults recover from addiction. To learn more about the challenge, you can visit the "Wipe the Face of Addiction" website. Getting into treatment for addiction isn’t easy, but getting out can be even tougher. There are 86,400 seconds in a day, and each one presents challenges when your body and brain are aching for a fix. Eve Goldberg and her son Isaac worked to face these challenges after he completed treatment for opiate addiction in 2013. But finding their way back to a normal life proved tough, especially without much day-to-day support. Isaac stayed in a sober living home, where he took random drug tests, went to meetings and lived among sober peers, but there wasn’t much training in basic life skills like grocery shopping, cooking or managing money. No activities to show tenants how fun life in recovery can be. Without these, Isaac struggled. So what can the newly sober do to safeguard their recovery in the vulnerable days following rehab? For example, Eve founded BIGVISION, an organization that teaches skills and provides fun events for young adults building new lives in recovery, as a way to help others after Isaac relapsed and died from an accidental drug overdose in 2013. Twice a month, a group of young people gets together to go hiking, go-karting, jewelry-making and other activities that make recovery more rewarding than relapse. “We’re giving them fun, sober experiences outside their norm – something different from a meeting or a therapy session but that’s incredibly important in helping them adjust to life without drugs,” says Eve. The experiences are healing for the young participants who are learning a new way of life, and they’re also healing for Eve and her family as they grieve their tragic loss. Look for similar organizations in your area, and ask around at support group meetings and rehab centers if there are other types of support available to you. 2. Make new friends, delete the old. It’s one of those non-negotiables of early addiction recovery: you have to cut ties with old drug-using buddies. Rodney Robertson, D.Min., MA, M.Div., a family therapist at The Ranch treatment center in Tennessee, goes a step further. He suggests that his clients go through the contacts on their phones and delete the ones that may negatively influence them. You may also want to consider getting a new phone number so you’ll only be contacted by safe, sober people you’ve provided the number to post-treatment. Just as important as removing unhealthy influences is meeting new, sober friends. Otherwise, says Robertson, you risk becoming isolated and bored, both of which can lead to relapse. Support groups are an obvious choice for some. In addition, organizations like BIGVISION make it easier for young people to develop healthy friendships. They introduce new activities and hobbies and foster a sense of relaxed community so young people have something productive to fill their time. If you went to drug rehab, you may have other resources at your disposal, such as an alumni group, that can provide an outlet for fun and sober support. 3. Follow your recovery plan. Most people leave rehab with a recovery plan. This typically includes support group meetings, working with a sponsor, ongoing therapy sessions and other types of aftercare. Taking care of yourself is another important piece. To keep your mind recovery-ready, rebuilding your physical health with regular exercise, adequate sleep and a nutritious diet must be part of your self-care routine. 4. Stay busy, but not too busy. “Coming out of rehab, idle time is your worst enemy,” says Robertson. “When you don’t know what to do with yourself, old patterns, thoughts and behaviors can creep back.” Staying occupied with healthy pursuits, such as working a part-time job, volunteering, going back to school or attending outpatient treatment, can stave off boredom and make sober life full and rewarding. 5. Get help if you’re struggling. Research tells us roughly half of people in recovery from addiction will relapse, most often within the first few months after treatment. This doesn’t mean rehab was a waste or that you’re doing something wrong. Just as someone with heart disease or diabetes needs follow-up care to stay well, a person recovering from the chronic disease of addiction needs ongoing support to stay sober. Don’t let shame or overconfidence stop you from reaching out for help if you notice yourself slipping back into old patterns. Have an automatic response ready – go to a meeting or call your therapist, drug rehab center, sponsor, or a sober friend or loved one you trust. Just don’t assume what you’re feeling will go away on its own. Building a new life without drugs or alcohol is no easy task, and you’re not expected to do it on your own. It’s been two years since Eve Goldberg’s son, Isaac, died from an accidental drug overdose, but it still feels like yesterday. After struggling with addiction for years, Isaac completed rehab for opiate addiction in 2013. But finding his way back to regular life proved tough, especially without much day-to-day support. For a while, things went well. Isaac stayed in a sober living home, where he took random drug tests, went to meetings and lived among sober peers, but there wasn’t much training in basic life skills like grocery shopping, cooking or managing money. No activities to show tenants how fun life in recovery can be. Without these, Isaac struggled. Months later, he relapsed. Eve saw the signs and tried to talk with him about it, but he didn’t want to admit it. One night, Isaac went to bed not feeling well; the next morning Eve heard unusual breathing sounds coming from his bedroom and when she checked on him, she couldn’t wake him up. After six weeks in a coma, the doctors told Eve that Isaac was gone. Eve was well-educated about addiction. She stayed close to Isaac and kept the lines of communication open. But unfortunately, she warns, “even if you see the signs you can’t always do something about it.” Addiction hijacks the brain, leading people to hide, lie and manipulate to maintain their drug abuse. Isaac didn’t want to die. He wanted to get better. But there is simply no logic in addiction. One year after Isaac died, Eve found a way to make meaning out of her tragic loss. She founded BIGVISION, an organization that provides fun, sober activities to young adults transitioning into regular life after completing rehab or sober living. “Anyone can go to rehab. There are tons of treatment centers out there,” she says. But there aren’t many organizations dedicated to teaching young people how to live again, and how to make sobriety fun and thus sustainable. Twice a month, a group of young people gets together to go hiking, go-karting, jewelry-making and do other activities that make recovery more rewarding than relapse. Participants can even learn to cook and knit. So far, BIGVISION has been self-funded (with generous contributions from friends and family), but Eve is starting to raise money to expand the organization’s offerings and reach. To continue her mission, Eve has her sights set on building a clubhouse, a home base that’s open late at night where young people can hang out in a safe, comfortable, sober environment and do fun activities instead of drinking or using or, more commonly for someone new to recovery, sitting home alone doing nothing. Eve is also working on getting other parents who have lost children to addiction involved so, if it helps them grieve, they too can turn their resentment and anger into something positive.